In the second part of this article, we saw the time span of the decommissioning (at least thirty years), the cost (unknown in general, estimated 5 billion dollars for Greifswald nuclear power plant), and the decontamination process. In concrete, the decommissioning is a process of cutting the whole nuclear plant into 1m x 1m x 0.7m boxes, and cleaning up everything until the box shows less than 10 mSv/y. The process takes more than a few decades. However, the city Greifswald industrialized this hard process, created employment, and is planning to export the technology. In the final part of this article, I would like to think a bit about what I can do when I face energy policy. When Fukumoto finished the talk about the decommissioning, he added his comment how we citizens could face the energy development. First, he mentioned the Rio declaration [Rio Declaration 1992]. This is a short document produced at the 1992 United Nations “Conference on Environment and Development.” This is a guide of how we can achieve a sustainable development in the world. Our current development with nuclear plants seems not sustainable, since the decommissioning cost will be mostly paid by descendants of the people who actually don’t use the energy. Also, we have only little idea about the total cost of decommissioning, it makes it hard to plan the future. Fukumoto suggested the following: please learn the basics as precisely as possible, please decide yourselves based on your own understanding, please think what you can do in your every day life and execute it. From now on, I would like to talk about my personal opinions after the discussion meeting. I am interested in the Rio declaration, since it is a guide on how we can achieve sustainable development. The development of the human being has not only spatial spectrum, e.g., each nation’s development, but also has time spectrum, e.g., from past to the future. I agree that one generation should not consume all the resources and should not cause a burden to the following generations. If we don’t care about sustainable development, our children and grandchildren will be forced to pay our legacy, they might have to walk the way of the ruin in the worst case. I feel sad if we continue to put a burden on our descendants. I believe that we should not strive for current temporal prosperity, but we should seek the future, long term prosperity. I don’t want to destroy the future of our world. In the Rio declaration in 1992 by the United Nations, there are 27 principles of how we can achieve sustainable development. I found principle 1 and 3 are quite prominent, so I put them here. Principle 1. Human beings are at the centre of concern for sustainable development. They are entitled to a healthy and productive life in harmony with nature. Principle 3. The right to development must be fulfilled so as to equitably meet developmental and environmental needs of present and future generations. Unfortunately, the task of decommissioning is a burden to the generation which actually executes it. In the current situation, the generation which used the energy didn’t pay the cost, but the descendants have to pay it. We borrowed this money from the future and temporal prosperity. Do we really want to put the debt and the risk on our children? Can we really put this burden on our children to make the current electricity bill cheaper? Is this really good for the future of our country and the world? I feel I need to think about that. In the internet age, we can find some information about the decommissioning. I think knowing the problem is a good start. The Fukushima disaster showed us that we would lose a part of the country for a long time. People lost their place to live, people were exposed to health risks, especially younger generations. I found that I needed to understand the problem myself, not just follow the authorities. Understanding the problem is a first step and everyone can start it together. My personal questions are: who pays the decommissioning for these outdated reactors, how can we trash the nuclear fuel and the waste? I once wondered, if the decommissioning is too expensive, can we just keep the reactors as is? It turns out the managing costs of reactors without generating any energy is also expensive. It’s 12 billion dollars per year for the reactors in Japan [Nihon Keizai Shinbun 2013-3-29]. Fukushima might be the second wake up call for us. It reminds us of our debt to the future. I would like to think how can we repay the debt and how can we alleviate the burden on our descendants. We can think about saving energy. The countries that have already implemented electricity liberalization like Germany and Japan can choose the electricity company which doesn’t have a nuclear legacy. That seems a good start to do. If your country has not implemented it, you can discuss about it. I think one more important thing is executing your vote since we need to pay for the actions of the government. We can also look up how the other countries do the decommissioning. We pay the electricity bill and that goes to your power company. So we can watch how it is spent. We can be just interested in it since it was our money anyway, especially if your country implemented rate-of-return regulation like in Japan. Rate-of-return regulation has some advantage, but there are some disadvantages also. We could check whether this method is correctly working or not. Everything I wrote here is a small thing, but thus everyone can do them. Maybe this doesn’t change anything. However, I believe something I can achieve is based on everyday life. Although what we can do in a day is small, continuing one thing might make the difference. Of course it might be nothing. However, I am sure of one thing: Nothing will be changed if we do nothing. I would like to have a option for the future. This article is also one of the small things. Although this is a thing I can do: Collecting information, understanding it, and writing it down. If you have any good ideas, please share them. That would be a thing you can contribute to the future of the world. When you read this article, please do not just believe this since I might have mistakes and misunderstandings. Please double check the information presented here by yourself. I provide the references for help. I hope I will not have to suffer and I will not to see other people suffer again, hearing only “Unexpected” as an excuse. We could start thinking as the first step. I hope this summary is useful for someone. In the second part of this article, we talk about what nuclear decommissioning is. A nuclear reactor is just a huge kettle, but the main difference from a normal kettle, we can not easily trash it, because of radioactive substance contamination. A nuclear decommissioning is a decomposition process to make a reactor to be safely trashed. We would like to talk about a time span and cost of the nuclear decommissioning and what to do about the nuclear waste. We also look close on a on-going decommissioning process example in Greifswald, Germany. Our current time estimate of nuclear decommissioning is at least thirty years for both immediate dismantling and safe enclosure methods. The cost of decommissioning is not clear. One reason is that each reactor is highly customized to adapt it to its power plant. The nuclear decommissioning of Greifswald is estimated to cost around 5 billion dollars (Assume 1 dollar = 100 yen in this article). German power companies are required to save 30 to 36 billion Euro for the nuclear decommissioning budget. Since there is no international standard for the decommissioning budget, some countries have no budget at all. The German government once wanted to establish a governmental fund for the decommissioning. However, the power industry refused to do so, since the power industry didn’t want to give the saved money to the government. Therefore, the plan to establish a fund was dismissed. But, the current estimation tells us that these saving are not enough. Therefore, the industry has changed their mind. Now the industry wants to have the fund backed up by tax money because even if the budget is short, the industry doesn’t need to take the responsibility. They hope the German government would take over the responsibility to cover the cost. In such case, our next generation who never used nuclear energy have to shoulder the cost. We don’t know where this discussion goes yet. The waste produced by a decommissioning process is classified as high/middle/low-level waste, and others. The classification depends on the level of radioactivity as well as on the type of the waste. The criterion of whether it is nuclear waste or not depends the strength of the radiation from the waste. If the dose equivalence is more than 10 mSv/y, it becomes a nuclear waste. Although there is no guarantee of safety even if the dose equivalence is lower than 10 mSv/y, if it is less than 10 mSv/y, we are allowed to recycle them in the common market. The toxicity of the (fuel) waste depends on the nuclide, the criterion is defined by nuclide. Decontamination of nuclear waste is a process to remove radioactive contaminants from the surface of a non-radioactive substance. We could lower the degree of contamination of the waste by removing the radioactive substances. This reduces the total amount of nuclear waste, therefore this is an important process in the decommissioning. Please note that decontamination is not the process that makes radioactive substances innocuous. Most of the nuclear waste, e.g., pipes, pumps, etc., are originally not radioactive, but are contaminated by radioactive substances. Therefore we could clean up their surface by high pressure water, high pressure water with steel powder, or by a chemical process (melt off the surface by acid, for instance). Basically, we have not yet had an practical technology to nullify the radioactivity. It means we cannot make the radioactive substance non-radioactive by reasonable cost. Therefore, the only thing we could do is just to collect and store them somewhere and wait decades until the level of radiation becomes low enough. The radioactivity of these pipes and other objects is lower after the cleanup. In this way, we could reduce the amount of middle/low level nuclear waste. (Decontamination is meaningless for the high level nuclear waste since the high level nuclear waste is usually the nuclear fuel, so clean up the surface doesn’t help to reduce the radioactive dosage since the inside is also radioactive.) Decontamination processes could reduce the total amount of nuclear waste to around 5%. The remaining 5% waste will be sent to a final processing place (usually we need long term management for the waste), however, this is beyond the scope of this discussion session. Greifswald nuclear power plant is executing the largest nuclear power plant decommissioning in the world. Greifswald is located in the north-east of Germany. Five nuclear reactors are in the decommissioning process. In this discussion, Fukumoto picked up Greifswald nuclear plant as an example of nuclear decommissioning. This plant was granted the decommissioning permission in 1995 and started the process after that. When the plant shut down, there were 10,000 employees (and half of them were working on building new reactors). The size of company organizations in the East Germany tended to be larger than West German organizations at that time. Thus it is not simple to compare the size between the organization and a contemporary organization. For instance, after the German reunification, when the East German companies changed their system to the West German system, some of the organizations drastically downsized. After the shutdown of the Greifswald plant, some people found their job related with a new interim storage construction. Some retired according to early retirement schemes. And some of them work for the nuclear decommissioning company. Currently, 1,500 employees are working for the decommissioning company. Later, several new companies re-use the former site of the plant. Some of them are new green energy companies. Greifswald people are also working for these new companies. The decommissioning company estimated they had finished 70% to 80% of the process in 2013. However, everything is “learning by doing” as the company’s spokeswoman said. They started the immediate dismantling for the reactor unit one, but by the time they finished the process, it turned out that the cost for the immediate dismantling was too high. This lesson learned made them change the strategy. The new plan is to use the safe enclosure method. They first store the reactor pressure vessel and the steam generator in an interim storage facility for 50 years until the level of radiation becomes low enough and then proceed to the decommissioning process. We don’t know when this process in Greifswald can be completed, but it will most likely take at least until 2045 or longer. Figure 2-1 shows the time line of the life of Greifswald reactors. The author (of this article) could not find out when they decided to use the safe enclosure method. We only know they decided after the reactor unit one is decomposed, but don’t know when it was. We could only say that it will not end before 2045. However, we could not find out how long this process will take. The total cost of the decommissioning is not clear yet, but the current estimation of the company is 5 billion dollars (1 dollar = 100 yen). 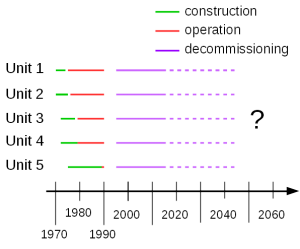 Figure 2-1: Greifswald nuclear reactor timeline (build, run, decommissioning).A part of data source is [Greifswald]. x axis represents C.E. I understand that the decontamination process of decommissioning is done by cutting down the whole nuclear plant to 1m x 1m x 0.7m boxes. Then everything of the plant must be cleaned up. Literally everything, pipes, pumps, containers, walls, … are diced down to put into the boxes for the radiation inspection. If the radiation in the box is detected higher than the defined tolerance level, the box will be returned to the decontamination process again. Actually, the dimension of the box is not clearly shown, this size is rough estimate from the picture we saw in the discussion. (In the picture, a person explained about the box.) Each decontamination worker must wear a special protection suit. They must go through the decontamination process in a small chamber every time so that no radiation will be spread outside of the facility. The process is basically all manual work. All the boxes go to the low-level waste must pass the inspection test. After twenty years of the process, they still have not finished the decommissioning. The estimated current progress is 70% to 80%. Higher radioactive waste will first be kept for fifty years in a interim storage, then the decontamination process of them will start. The life of a nuclear power plant is not finished when the plant shut down. Even a nuclear power plant closed its operation, there are remaining steps such as decommissioning. Decommissioning process provides numerous employment opportunities for a while. In the case of Greifswald, the skills and know-hows they have gathered became a strength of the city. They are also actively inviting other new businesses to the industry area where the nuclear power plant was located. A part of the industry area has been used for factories of natural energy. The substations and the grids that were formerly used for the nuclear plant are now being re-used for the offshore wind power plant. These components are shipped to the ocean from the port that was modified from the drain of the nuclear power plant. A new gas power plant, which is under construction, has also a plan to re-use these substations and the grid. A decommissioning process requires a large number of skilled people for decades. The city of Greifswald is hoping to grow as a pioneer and lead the decommissioning industry in and outside of Germany by using their skills and know-hows. I am surprised that the decommissioning process takes at least more than 30 years. Some parts of the process first need to wait 50 years before starting the actual dismantling. Also we don’t really know how much it costs. Importantly, we don’t know who will pay for it. That depressed me. The fact that the process takes such a long time means that the people who didn’t use the electricity should pay it. And actually it is us and our children. Why should people who didn’t use the energy pay for it? This will be a burden for our descendants. I wonder if this is OK for the future of our country. In this case, parents spend the money of their children, grandchildren, and further descendants. What kind of parents do that? This — taking money from descendants — has already been started. Some countries started to use nuclear energy earlier than Japan. For example, nuclear energy has been used from the mid-50s in U.K.. Those old reactors had already been retired. However, they started to pay the decommissioning recently. This means a large population of UK, who haven’t used the energy from these reactors, need to pay for the decommissioning. The estimated cost of decommissioning by the NDA (Nuclear Decommissioning Authority) of UK was 49 billion pound in 2010, and then the NDA adjusted the estimate to 100 billion pound in 2013 [The Guardian 2013-06-23]. On the other hand, the people of Greifswald in Germany industrialized the decommissioning process and created employment. I see they are trying to make the future. They are also expecting the big decommissioning time is coming in the world, therefore they have a plan to export their decommissioning technology to other countries. Most of the people don’t want to think about the retired nuclear reactors, therefore people are willing to pay for the decommissioning technology. Some part of me also does not want to think about the decommissioning. I think decommissioning is dangerous, time consuming, and expensive. I found Greifswald people are amazing. They have my respect. I believe I can learn something from them. So far, we looked into the decommissioning. Now I have some information about it. Then, the next question is “what can I do for that?” Even if I can change nothing, how can I behave with this reality. I would like to think through about it. The next installment will be the last part of this article. 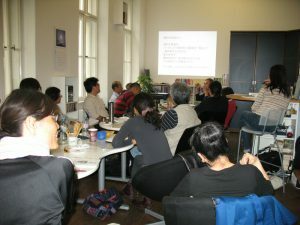 2014-9-13 in Berlin, `Sayonara Nukes Berlin’ had a discussion meeting, entitled: Let’s talk about the nuclear decommissioning. We would like to report the summary of the discussion. Part one of this article outlines why we had this discussion. After the Fukushima Daiichi nuclear disaster, we often heard the words, “nuclear decommissioning.” We also heard about reactors reaching the end of their design lifespan, and that these reactors to be decommissioned. It’s similar to when something is broken, or not working anymore. But, it leads to the natural question: can we simply trash nuclear reactors? Can we recycle them? It seems that this is not so simple. Since any nuclear reactor has its own limited lifespan, we cannot avoid nuclear decommissioning. We, some of the members of Sayonara Nukes Berlin, just wanted to know what is it. Then, we asked Fukumoto to talk about nuclear decommissioning. Fukumoto has been following energy issues for a long time including nuclear energy problems. Fukumoto immediately answered us, “If you know about the nuclear decommissioning, you will see the nuclear energy system and its industry.” The photo below shows a shot of the discussion meeting. This blog article is a summary of my understanding of the discussion. Fukumoto is a free journalist. He lived in East Germany (Deutsche Demokratische Republik) in the mid 80s. There was the Chernobyl nuclear incident. For him, that was an on-going disaster experience and that was the clue to follow the nuclear energy problems. He is the author of a book [Fukumoto 1] dealing with the radioactive contamination problem of Chernobyl. He is also one of the creators of a TV documentary about nuclear decommissioning [Fukumoto 2]. In the discussion meeting, Fukumoto suggested to talk about Greifswald nuclear power plant as an example of a nuclear decommissioning since it is currently the largest nuclear decommissioning project in the world. 1.2 What is nuclear decommissioning? A nuclear reactor is fundamentally the same as a huge kettle. We generate high pressure steam by the huge kettle and drive a steam turbine to generate electricity. Since we used nuclear fuel to boil the water in the kettle, we call the resulting energy nuclear energy. This huge kettle is called a nuclear reactor. Since this nuclear reactor uses highly radioactive dangerous substances, a nuclear reactor should be processed and appropriate safety measures have to be taken before trashing it. This process is called nuclear decommissioning. A nuclear decommissioning is a process to restore the site’s “greenfield” status. Radioactivity surveillance for the area should not be required after the decommissioning. However, a nuclear decommissioning is only of the cleanup. Nuclear decommissioning produces radioactive waste and processing radioactive waste was beyond the scope of the meeting. We may have another discussion meeting for the topic. When the area is back to a greenfield status, then that is the end of nuclear decommissioning. So, when does a nuclear decommissioning start? The nuclear decommissioning started in the design phase of the plant and the reactor. To make the decommissioning process safe, we need to design a reactor that can be safely decomposed. For instance, we need to build a reactor that can be carried by a crane (or by some kind of machine) to remove it from the building. Otherwise the process would become difficult. Pros: There still are the workers who know the plant details. This is an advantage for the decomposing operation. Nuclear reactors are not standardized. Each plant is highly customized. Therefore, availability of the workers who know the plant is an advantage to operate the decommission. On the other hand, immediately after the shutdown of the reactor, the radioactive dosage is still high. This makes the decommissioning operation difficult. We need to develop some kind of technology, for instance, using a special robot. The process is relatively easier than the immediate dismantling method since the radioactive dosage will be relatively low. But we can never completely remove the radioactive contamination in several decades, the difficulty is only relatively lower. On the other hand, this method needs more than thirty to fifty years of storage time, we usually cannot expect the help from the workers who know the plant details. Everything on the earth has a limited lifetime. A nuclear reactor is not an exception. However, I haven’t heard what happens when a reactor reaches the end of its design lifespan. I can easily imagine that we cannot trash it like a piece of paper. In this article, we talk about what is a nuclear decommissioning and how could we do that. My main concern is actually “Is it really possible and how?”, “How much does it cost? Who pays that?”, and “What should we do about the nuclear waste?” The first question has been answered in this article: It might be possible, but it is difficult. Before the Fukushima disaster, I was less concerned about the energy problem. I simply thought, “Anyone should have thought through it.” However, what we saw in the Fukushima disaster was “No one thought about it.” and “No one wants to take responsibility.” The responsible people told us, “it’s unexpected.” One of the strangest logic was that “It’s unexpected, therefore no one takes responsibility. It is a natural disaster.” I can hardly understand that a nuclear reactor explosion is a natural disaster. I personally thought, I don’t want to die with the reason of “unexpected.” The Fukushima disaster opened my eyes, it said “Hey you, wake up!” But I don’t know what I can do about this. Maybe it is better if I keep sleeping, ignoring the Fukushima disaster. However, I also know that if everyone keeps sleeping, the next disaster is unavoidable. Whether I am ignoring the problem or not, Japan has around 60 nuclear reactors. That fact always remains. I asked myself, “Why did this happen to us?” A part of me still wants to go back to be a person who doesn’t think about this problem. On the other hand, I cannot stop thinking what Fukushima really means: What does it mean to use an energy source that forces us to lose a part of our country? What does it mean to use air conditioning and to access the internet powered by nuclear reactors which endanger the life of people, especially children’s lives.